Home Blog How Does Blogging Increase Sales? ‘Can blogging boost your sales?’ Now, that would have been a relevant question about five years ago, but not now! Today, blogging has proved to be an effective tool for brand promotion and sales. Bloggers have quite literally taken the digital world by storm and opened new sales avenues for companies and individuals. According to a study regarding the behavior of online users, it was found that a whopping 81% users trust the content of a blog post whereas an astounding 61% make their choice based on the blog recommendations. These figures are enough to testify the impact that a blog can have on the mind of a customer. If companies can harness the huge sales potential that a blog has, then they can quickly turn it into an effective sales tool. 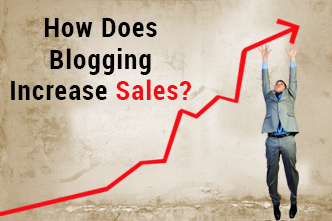 So, now the real question is how can you use blogging to increase your sales? Blogging is a cost effective way of increasing inbound traffic to your website. If your blog content is SEO friendly, your content has a higher probability of getting ranked. As a result, your content will be more accessible for readers who are specifically looking for relevant pages. One more advantage of blog advertising is that every blog post that you create will be indexed as a different page. The more index pages you have, the more chances of search engine ranking your website above rest. This will increase inbound traffic to your website and the search engine will perceive you as an authority upon that subject. Online marketing firms have a robust blog advertising strategy in place. They often have a dedicated team of bloggers who produce professional, SEO friendly content for blog promotion. However, if you are an individual looking at blog for a cost effective marketing tool, then writing blogs on your own may be your best option. In that case, you may benefit from these blogging tips to increase sales. There are three ways of getting traffic to your website – Free, Paid and Referred. Identify the main source of traffic for your website. Check if the option of blog advertising is really relevant to the type of business/brand that you are into. About 92% of companies that post blogs at least 3 – 4 times a day acquire customers through their blogs. So, it makes sense to post as frequently as your business demand. Update obsolete, irrelevant information and keep your blog up-to-date. As readers are inclined to trust whatever you post, make sure your blog content is highly informative, relevant and error free. Adapt a style that suits your brand image and be consistent with it. Provide detail information about your products, services through your blog. Treat your blog as a platform to reach to prospective clients and listen to their requirements. Open the comments section and encourage your readers to post their views. Answer frequently asked questions through posts so that your audience knows you are listening. The last thing to make your blog advertising a success is by campaigning hard on all relevant platforms. The more backlinks you get, the chances of them getting converted into fruitful business leads is more.